Prominent rabbi and Talmudist of the second half of the eighteenth century; a descendant of Joshua Falk Kohen of Lemberg and of R. Liwa (MaHRaL) of Prague, and a pupil of R. Moses Zarah Eidlitz of Prague, author of "Or la-Yesharim." He was dayyan or judge at Lissa while R. David Tebele was chief rabbi there, and was, therefore, a member of the council which in 1782, under the presidency of David Tebele, condemned and burned Naphtali Herz Wessely's letter entitled "Dibre Shalom we-Emet." 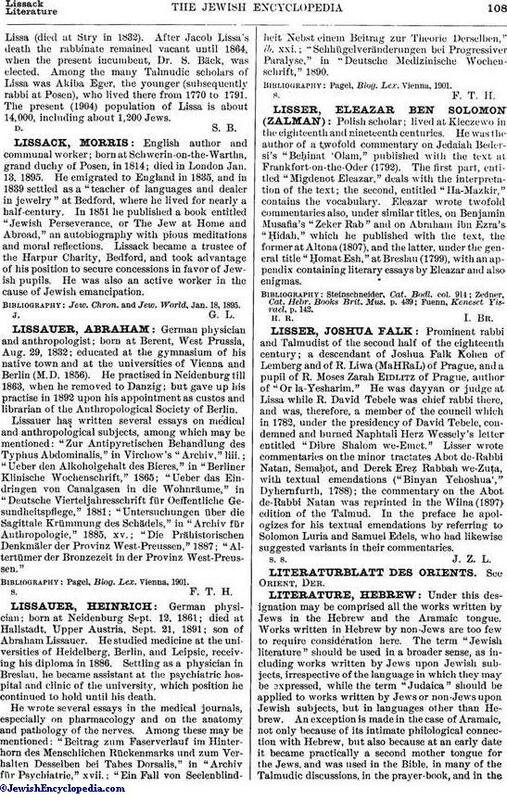 Lisser wrote commentaries on the minor tractates Abot de-Rabbi Natan, Semaḥot, and Derek Ereẓ Rabbah we-Zuṭa, with textual emendations ("Binyan Yehoshua'," Dyhernfurth, 1788); the commentary on the Abot de-Rabbi Natan was reprinted in the Wilna (1897) edition of the Talmud. In the preface he apologizes for his textual emendations by referring to Solomon Luria and Samuel Edels, who had likewise suggested variants in their commentaries.